Long before Spotify and YouTube there was an ambitious young band called Daniel Takes A Train. The London group were part of a colourful and eclectic 1980’s music scene working in and crossing musical genres that included synth pop, indie rock and jazz revival before calling it a day on the eve of Acid House and rave culture. Matt Mead investigates the band’s forthcoming debut release on Firestation Records and interviews the band exclusively for Louder Than War. 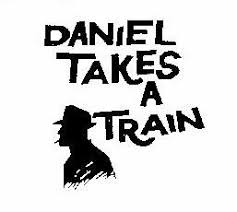 Named after a Hungarian art-house movie, Daniel Takes A Train was formed in London in the early 1980’s. Performing under the name Illicit Kiss with Rupert Blomfield on bass, they rehearsed in a cellar off the King’s Road and performed at West End nightclubs attracting a cult following on the club and live music scene. With the addition of James Hannington (drums) and Paul Davey (saxophone), the newly-named Daniel Takes A Train swapped floral shirts for polo-necked jumpers and developed a slicker, more contemporary sound – one that would be more likely to dent the pop charts of the day. Trading funky basslines and jazz guitar licks with their natural pop sensibilities, the boys got a manager and began playing bigger venues including The Astoria and Ronnie Scott’s and also at the capital’s illegal warehouse parties. The big record deal eluded them but they earnt a Sunday newspaper spread for playing a record 25 consecutive gigs on the Circle Line and headlines for blagging their way into the 1987 Brit Awards after party. A Radio One DJ hailed them live on air as “the highlight of the evening”. Their final appearance together was a trip to Canvey Island funfair for their long-awaited promo video. In 2008 the band reformed to enter an Absolute radio competition. After this, they launched a CD single ‘One Last Dream’, appearing to fans old and new at a special one-off performance. For years, all they had were memories of playing at Ronnie Scott’s, the day trip to Canvey Island where they shot a video, a photo session for Just Seventeen magazine and meeting Paula Yates and The Pet Shop Boys at the 1987 Brit Awards – which they had gate-crashed! Fast forward almost exactly 30 years, and a German independent record company who just happens to be besotted with 1980’s British jangle guitar pop get in touch with the band via their Facebook page. Do you want to appear on our next compilation album they ask? Sure, they say. But when one band member discovers a collection of their old songs on dusty old analogue tapes in the loft, they reckon they have enough material for an album of their own. LTW: Can you please detail some of your upbringing? Paul Baker – My Dad loved his music and I grew up listening to the smooth sounds of Sinatra, Scott Walker and Mel Torme, Crooners who knew how to sell a song, I was hooked and sang at talent shows like Butlins, honing my stage skills for the adventure that was to come with Daniel Take A Train. I moved to the bright lights of London from the sleepy Kent seaside town of Deal and got hooked on early 80’s music and the cool fashion of the day. Can you please tell me some of the first music you remember hearing? What was it about the music that you liked? As I said it was the likes of Sinatra, Jack Jones, Scott Walker, Mel Torme, Matt Monroe, Tony Bennett, Bobby Darin, Ella Fitzgerald, Dionne Warwick and Nat King Cole. I liked the soulful lyrics and big band sounds, the songs had great melody and strong hooks. Apart from the obvious Sinatra, Mel Torme had a velvet voice that drew you in and I loved the tone of his voice. (Paul Davey – My earliest musical memories are from the Sixties – a rich musical period with great bands and memorable songs. My sister and I used to buy lots of records and sing along to them at home. I particularly liked songs like “It’s Not Unusual” and “Downtown” that had exciting brassy bits. I was lucky that my music teacher was an ex-pro sax player and he got me into playing the saxophone in my early teens. In the early Seventies, there was big band revival and my parents took me to hear the swing music of Glenn Miller and others that they had grown up with and that ultimately got me into playing jazz and improvised solos. My influences were lyrical, melodic sax players like Stan Getz on The Girl From Ipanema, and Paul “Take Five” Desmond. What was the first serious music you got into? On moving to London at 18 I had the chance to start going to gigs, I got interested in the ska scene and loved The Beat and Madness, other bands included The Jam and The Police but when The Smiths broke onto the scene I felt I’d found a band I could relate to, in fact it was when Dan the Guitarist played This Charming Man down the phone to me (No emails/mp3’s/social media/dropbox etc. in those days). 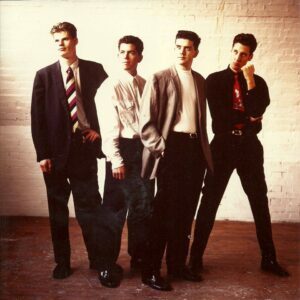 we knew this was the sort of sound we wanted and that song inspired us to form our first band, Illicit Kiss, from then on it was the likes of Orange Juice, Aztec Camera, The Blow Monkeys, Hue and Cry, Prefab Sprout, and The Housemartins before getting hooked on the lush sound of ABC and the sultry sax of Spandau Ballet. I even played football once with Martin Kemp as I knew the lads from Animal Nightlife and they invited me along to a game! Apart from my Dad, who had a great voice would have to say Morrissey and The Smiths were the biggest influence, those jangly guitars that played around in your head and the colourful and contentious lyrics got me writing songs around unrequited love and vulnerability. When did you decide to pick up the instrument you eventually played in the band? I always liked the idea of being the frontman and could hold a tune so this was the obvious path for me, my Dad sang and was once asked to front a Big Band on a nationwide tour but didn’t believe in himself enough and didn’t have my confidence, so sadly it never happened. I finally got him into a recording studio on his 80th Birthday to record 6 precious tracks, 4 years before he sadly passed away. How did you all meet each other in the band? Dan and I met at The Marquee Club at a Secret Affair gig! We got chatting at the bar talked about forming a band when I heard he played guitar and he found out I wrote lyrics and swapped Home numbers.I had written a catchy little ditty called Essex Girls which I had written with Tom Robinson (Another story – I had given him my number after a Tom Robinson Band gig and said I had some ideas for a quirky song, and amazingly he got in touch!) I was, as it as it turns out 10 years ahead of my time with the whole Essex thing! Were you in bands before Daniel Takes A Train? As I mentioned Dan and I put together Illicit Kiss and were joined by Rupert Blomfield on Bass and our first drummer was actually Jon Marsh who went on to form The Beloved Interestingly I took Jon to a club called Cha Cha’s and it was there that he heard the dance music which he says was a defining formative experience for which he was forever grateful to me as it inspired him to form The Beloved. I was interested in music from a young age; but didn’t start playing an instrument (bass) until three months before the first gig of Illicit Kiss (later renamed DTAT) at Central London Polytechnic in about 1983. My first musical influences were The Beatles; I remember my stepfather playing Abbey Road and Sgt Peppers a lot. When he brought back the White Album when it came out, it was the first music to really hold my attention; I probably wore that record out through playing it so much. Soon after that I got interested in the British Blues scene of the 1960s, through Eric Clapton, John Mayall and Fleetwood Mac. By the early-mid ‘70s I was wondering what the younger generation of American artists influenced by the Blues were doing. I soon discovered Jimi Hendrix, Sly Stone, The Doors and Soul artists, such as James Brown, Otis Redding and Curtis Mayfield; followed quickly by Herbie Hancock, Miles Davis, Frank Zappa, Iggy Pop and Little Feat. I spent a lot of time trading and stealing records at The Record & Tape Exchange in Notting Hill Gate at this time and owe them a huge debt of thanks for a big part of my musical education. After meeting Dan at a party in Clapham in about 1982, we found we had quite a few common interests musically. On visiting my flat in Brixton, he saw I had a bass and asked me to join the band. I don’t think I told him that I didn’t know how to play it; but by then I was regularly going to see The Clash and always thought Paul Simenon was the coolest member of the band. I accepted the invitation and quickly taught myself to play bass for Illicit Kiss. In the mid-‘80s we spent a lot of time going clubbing at places like The Wag in Soho, The Fridge in Brixton and numerous warehouse parties; where we listened and danced to Rare Groove and early Hip Hop and House music. Clothes were picked up from second-hand clothes shops, the Kings Road, Soho and Camden. The 1980s were an exciting time to be in your early Twenties; anything and everything seemed possible and it nearly was by the time we had morphed the band into Daniel Takes A Train. How did DTAT become a band? Dan knew Rupert who he shared a flat with, so we had Bass, Guitar and Vocals. We needed a drummer so put an ad in Melody Maker which read “Are you a Drummer with “Style, Charm and Commotion?” a gentle nod to The Style Council, The Smiths/This Charming Man and Lloyd Cole and The Commotions. James Hannington applied to the advert and was duly signed up. We just needed some icing on the cake and when Paul went to see a gig at The Old Firestation in New Cross he was impressed by Paul Davey the Sax Player in a band called Helen and The Horns so he took his details and invited him along to a rehearsal, Paul D liked the sound and Daniel Takes a Train had completed their line-up, Brother and Sister Bert and Emma Routledge, on keyboard and backing vocals gave the band the polished big sound that epitomised Daniel Takes a Train during the late 80’s. How did you all write songs? Were all the songs written by one member or did you jam out the songs? Dan would normally call round to Paul’s dockland flat with an idea and a guitar hook and sometimes a title and an opening line or two, Paul would then add the lyrical melody and work on the words and hook to complete the basics of the song , The boys would then present the ideas to the band and structure the songs to get the right sound. What was your first steps as a band into the music business like? Luckily I was in sales so had no issue with calling up labels and trying to book appointments, first ones were with Colin Bell at London Records and Colin Barlow at CBS, Dan and I took in our cassettes and got positive feedback but sadly no deal- Dan remembers going into EMI with demo one day and got the immortal comeback from the A&R guy “We’re not looking for the old Haircut 100, we’re looking for the next Killing Joke!” It was clear we needed to get noticed and that’s when Paul’s crazy publicity ideas kicked in! This resulted in getting an exclusive with The Mail On Sunday with their Guinness Book of records idea of playing 25 gigs in a day, the number of stops on the London Underground Circle Line plus headlining at Busbys at The Astoria in the evening! Then there was gate-crashing The Brits in 1987 and having Peter Powell of Radio 1 saying live on air that it was the best part of the evening when this young band blagged their way past security to hand out cassettes to all the industry bigwigs and bands of the day like The Pet Shop Boys, Wet Wet Wet and Meatloaf! Did any record labels attempt to sign you up? If so who and what happened? There was interest but sadly no deal, Chrysalis seemed positive and BMG sent over some A and R men over from Germany to a gig at Zeeta’s in Putney to hear Secret Love a song they were interested in , but the sound system that night was really poor and could have contributed to it not being taken any further. Radio London played one song 3 nights on the bounce and sadly the band split up just as the interest was hotting up. Dan had got frustrated that the band had no deal to show for all the hard work and after one final attempt with the video of I Don’t Want This Love which did not start well with 3 of the band in a pile-up on the way to the shoot! So it was time for Dan to get off the train and take the plane to teach the senoritas of Barcelona the merits of the English Language! I was mad about The Beatles aged 8 to 12 years and had all their albums even though they were no longer together. My favourite Beatle would have to be Paul although Lennon’s voice is better. Around that time I got into glam rock and liked Marc Bolan. I was too young to be a proper punk but my first gig was Buzzcocks at the Hammersmith Odeon. I also saw Joy Division at a small club in West Hampstead a week before Ian Curtis killed himself, so I consider myself very lucky to have observed the live music scene at the fag end of the 70s. At school in south east London I played trumpet but as a teenage rebel I bought an electric guitar in a junk shop and learnt to play chords from the Buzzcocks and Jam songbooks. Aged 17, my new wave band Smallprint played at some weird venues including Feltham Football Club ( in front of neo Nazi skins!) and Chislehurst Caves which had a spooky hippy vibe to it. At one stage we had two drummers, one of them being Jon Marsh who was later in The Beloved. I think we were meant to sound like Adam and the Ants but it was probably a terrible racket! A few years later I met Paul. I was impressed by the fact that he had recorded with Tom Robinson, then very much a star, and I like the cheeky geezer synth-pop of Essex Girls; very Depeche Mode! The thing about playing with Illicit Kiss and DTAT was that we didn’t consider ourselves as very 80s. Personally, I was influenced by mostly 60s music like Motown or west coast psychedelia like The Doors or Love, then later Miles Davis, funk and jazz. The last thing I wanted was to be like Nik Kershaw or Howard Jones, even though this would have been a more successful way to go commercially. What was recording sessions like? Were these enjoyable for the band? 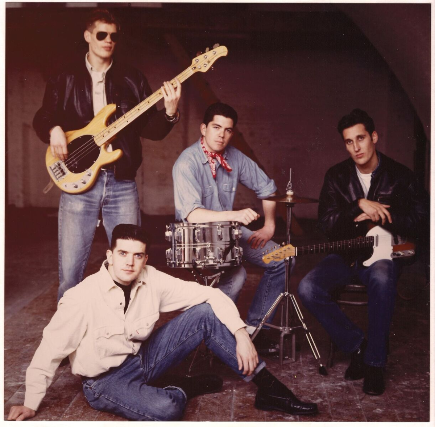 Getting into the recording studio and getting the songs onto tape was one of the highlights of being in the band, early tracks were recorded in basements in South London but as the band developed , better studios like Granny’s in Fulham where Curiosity Killed The Cat and Nick Heywood recorded gave the band the feeling that they were on their way! Bringing in session singers on percussion/keyboards enhanced the sound and the band had a quality product to take to market. Did you ever appear in the music press/radio/TV, of the time? Did you have any journos etc.. that cottoned onto you? How long were the band together? When did you split? The band were formed in 1984 and split mid-1988, completed over 30 gigs the likes of Ronnie Scott’s, The Embassy Club, Astoria, Empire Leicester Square , Hammersmith Palais, Le Beat Route, The Limelight Club , The Mean Fiddler ,Dingwall’s and The Rio in Dalston and probably the most memorable gig for all the wrong reasons, Sax Player Paul Davey takes up the story “That warehouse party under the arches is etched on my mind: the Mr Big in the white suit and bling who was the Svengali behind the whole thing; the exhaust fumes from the generator that barely powered the PA, so that every time James hit his bass drum the lights dimmed; the Police raid that ended the thing and the booze disappearing into the back of their van, no doubt destined for the Police Social Club” Happy days and may this was the hint that the boys time in the band were up! The Lewisham Labour club was the last gig a big difference from the glamour of the West end venues they had packed out! Fast forward a few years and you were headline news in the Telegraph due to Prince Harry becoming a fan? Can you please detail this incredible story? Virgin Radio ran a competition called One Last Dream to reunite your old band from yesteryear. I got in touch with Dan, who was in touch with Rupert and suggested we go for it as the prize was to open for Eric Clapton at Hard Rock Calling in Hyde Park in front of 40,000 fans! The boys were up for it but we’d lost contact with James Hannington our old Drummer who last we heard was a Milkman from Croydon! I looked over our songs, photos and stories and said we needed to find James, they put out a call James got in touch with the station and Christian O’Connell put me and James in touch live on air. We were chosen from the 100’s of bands who entered to be in the Final 5, this got whittled down to the Top 3 and then there were a series of challenges – write a jingle, do a version of Valerie and get judged by The Zutons etc , we got to the final 2 and part of our promo was to do a reunion gig , we managed to get booked for The Troubadour Club in Earls Court , so imagine our surprise when at the end of the gig we spotted Prince Harry in the crowd , in truth it turns out he was there for an after show party at the venue but that wasn’t going to get in the way of a good story and we got some great photo’s with him holding up Daniel Takes A Train T-shirts and promised he’d vote for us which got us some good press. Sadly we lost the final vote to a Rock band by 6% of the vote! Fast forward again to 2018 and we find Firestation records about to release your debut album. Can you please give some details of how this came to fruition? Were you surprised to be approached to release an album? It was a year or so James our Drummer feeling nostalgic decided to set up a Facebook page with photos and the video we did in 1988. We got a message enquiring if this label in Berlin could use the track I Don’t want this Love for a compilation album called The Sound of Leamington Spa Volume 9. We thought it would be fun so responded positively but Paul spotting an opportunity asked if they’d like to hear some other songs with a view to an EP/LP. I sent over the only 20 songs we’d ever recorded in a studio and amazingly the label came back and said they’d like to sign 17 of them for a vinyl and CD release. Finally signed after 30 years! Just incredible and we were surprised but very happy! Where have the recordings of the band come from? Have you had them in storage for all these years? I have always been very proud of the songs we created and despite 2 or 3 flat/house moves have always kept the old cassettes together and we found a few reel to reel tapes in Dan’s attic so we dusted them down transferred the song to CD and Mp3 and sent them over to Firestation. Are you going out on tour to support the release? Once we knew the album was going to be released around August time we thought it would be good to get a reunion gig sorted for a Launch Party. We tried Ronnie Scott’s as we’d played there in the old days but they wanted £500 room hire and £2000 guaranteed bar spend so we had to think again and after hearing our story Ian at The Troubadour , a venue that played a big part in our story was brilliant and gave us a Headline slot on 7th September to play in front of a hopefully sell-out crowd of 140. What do you hope those that will listen to the album will get to hear? The sound we created was very much the sound of the era, 80’s music has had a renaissance and it’s very big in Japan we hear , so hopefully people can listen to the songs and reminisce and also come along to the Launch party and be part of a great night, with Vinyl giveaways and hear songs that deserve to have their moment! Finally, which train service has been your most enjoyable to ride on? Paul- Took Mum for a ride on The Orient Express for her 90th Birthday – Guess it doesn’t get much better than that, chugging along through the Kent countryside on my way to Wonderland (Title of first track – side 2 of the Vinyl LP). You can follow the band via their Facebook page. The album can be purchased via the Firestation Records website.